Flower corsage for hair and a veil - too much? I a little confoosed about whether having a big flowery type thing in my hair and a veil is a bit ott? My dress is Josephine by MS and on the model she has this flower corsage in her hair and it looks lovely and kinda what im going for. Im not 100% on my hiar style yet but it will be up in some way. The problem i now have is when i went to a wedding fair i tried on a veil mainly to keep my MIL amused cause i didnt think id want one but i do actually like them. I suppose without seeing my dress on with a flower plus a veil i wont knw but has anyone else had this before and it looks ok or is it too much? The dress is not an ott dress so dont want my head area looking too fussy but i really do like the flower idea but now i kinda like the veil too. My MOH suggested maybe have the veil for the ceremony then take it off and clip in the flower afterwards? Im starting to feel like you're stalking my threads he he only joking. I was just thinking a plain veil with the thin ribbon around the the bottom but again didnt know if it would look silly cause the flower would be slightly to the side of my head. I know i really need to see it all on and when the shop calls me to say my dress is in, i'll go buy a cheap flower from new look or accesorize so i can see. Im so impatient. I could always try the old school stick a tea towel on my head or borrow a new curtain from my dads! How are ya hon anyways? Im not sure it will all go together with out seeing it? but i think it may be a bit to much. Maybe do what your MOH says and put it on afterwards? Oooh its you Wifey hehehe!!! Yeah get a cheapie flower and try it! Which dress have you gone for love? Ah thanks Amanda i love love love it too and cant wait to see 'my' dress - ive only tried on the sample. Ha ha yes its me Lilywilly - i wasnt planning on wearing the veil all day im worried it'll get in the way and i'll end up throwing it in the sea ha ha - but i suppose if im only gonna wear it for an hour max - is it worth buying one? Ive found a shop online that do them and seem quite reasonable price wise. I wish the flipping shop would hurry up cause then i can see if its a bit too much or if i'll get away with it. I have seen piccies with brides having both but their flower/corsage is smaller than what im thinking and it looks ok.
Ah thank you Mrs Tim2B - im still yet to find a dress twin though! It sounds lovely what your having with the hair garland, its certainley something a little different but always look lovely. I wouldn't worry about a dress twin, I don't think anyone else is wearing my dress http://www.charlottecasadejus.com/wedding_1.html but that's one of the reasons I love it! I'm using some lace that was my great grandmother's for the veil so I don't mind about only wearing it for a bit as it's not costing anything! Is there anything you can use like that?! I think it should look fine, if as you say, the veil isn't too fussy. My Facebook Page is http://www.facebook.com/pages/Lucy-Elizabeth-Creations/11585811285#!/pages/Lucy-Elizabeth-Creations/11585811285 Let me know if I can help! Ive attached the link case i have no idea how to put on photos! 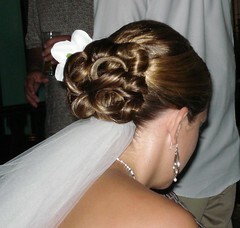 I was thinking of having the veiwl under the 'updo' rather than on top i think. Fairylu - that corsage is lovely but i think it is a bit bigger than what im looking for. I'll certainly keep your ebay details - do you have a shop? Ah thank you! I'm going for a very boho hippy feel so I love it! MrsTims i think i secretly love you!! Thank you for finding these - i really like the 2nd piccie and i think thats pretty much how i want my hair! Maybe a little higher so its not sitting at the bottom of my neck. I put some mood boards together a while ago so im gonna add that piccie to my hair one so i know what it looks like. And im secretly shocked cause i did think that having both may be a bit ott but it really doesnt look it. Thank you again - i must have been looking in the wrong places. Sorry in my excitement i forgot to ask - how are you ladies having your hair/ acessorising? Mrs Tims - do you have any piccies of what your hair/ garland etc is going to look like? When's your big day? No, I don't have a shop at the moment, maybe one day! I can make the flowers any size? Let me know if I can help.